Nāpali Coast is a very special place. The pali, or cliffs, provide a rugged grandeur of deep, narrow valleys ending abruptly at the sea. Waterfalls and swift flowing streams continue to cut these narrow valleys while the sea carves cliffs at their mouths. 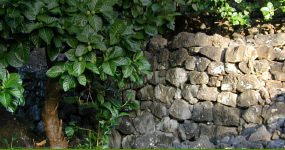 Extensive stone walled terraces can still be found on the valley bottoms where Hawaiians once lived and cultivated taro. VIEW “RENEGADES, RISKS AND REWARDS OF THE NĀPALI COAST” HERE. Day hiking is allowed without a permit up to Hanakāpīʻai Valley (2 miles in from trailhead). Anyone proceeding beyond Hanakāpīʻai MUST possess a valid camping permit. Camping permits for Nāpali Coast are extremely popular and often sell out months in advance, particularly during the summer. Please plan accordingly. Other than hiking the coast, the only way to legally access shore areas in Nāpali Coast State Wilderness Park is by boat.